By far the coolest thing I got at the Newport Cup was the FlightScope Mevo. As the West Team MVP—remember, in my version of the story, the West Team won—I received the Mevo. The Mevo was an item I was keeping an eye on. 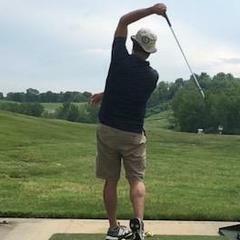 I do a decent amount of practicing into a net in the winter, and I always have been interested in a simulator or launch monitor to make that practice more effective. The Mevo seemed just about perfect for that. When I won the Mevo, I was eager to dive into it. It comes with a bunch of handy things. A little bag to carry the Mevo around in. A charger cord that will go into any USB port (i.e., you can plug it into a computer or your phone charger). It has a sheet of metallic dots, which you can order more of on FlightScope’s website. There’s an instructional manual as well. I ended up using the box to carry around the Mevo. I feel like with the carry bag, it’s too likely to fall out of my bag and be left behind somewhere. The carry bag is definitely handy to have, and it still adds another layer of protection to my precious new toy. According to FlightScope, the Mevo charge is supposed to last for about 4 hours, and to fully charge the Mevo takes about 2 hours. That seemed fairly accurate to me, although my untimed gut instinct is that the charge lasted a bit longer than 4 hours. Setup is fairly simple. You place the Mevo 4 to 7 feet behind the ball. The Mevo connects via Bluetooth to your phone. You need to download the Mevo app onto your phone to use the Mevo. In the settings on the app, you set how far behind the ball the Mevo is. The settings also allow you play around with stuff like altitude setting and how data is displayed. More importantly, the settings allow you to set whether you’re hitting outdoor, indoor, or pitching. Indoor really means you’re hitting into a net, because it’s the setting you use for when the ball travels less than 40 yards in a hitting cage. 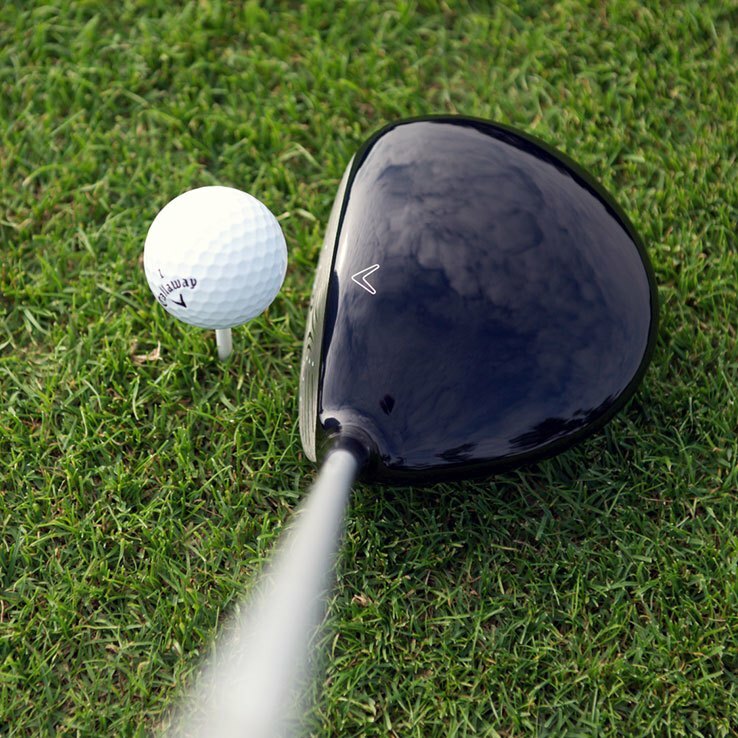 Pitching is when the ball flight will be less than 20 yards. You have to pay attention to some things during set up. You need just one ball in front of the Mevo so it picks up the ball you want it to. You also aren’t supposed to have electronic devices in front of the Mevo, because it interferes with the radar on the Mevo. In other words, keep your phone out of your pocket when using the Mevo. I just put my phone on my bag for easy access to the data. The only annoying thing about the setup is that you’re supposed to keep the Mevo a particular distance behind the ball. On a mat, that’s not a big deal. But if you’re on grass and taking divots, it can be annoying. That said, I’ve found that the Mevo works just fine if you’re somewhere around 4 feet behind the ball (I default the distance setting to 4 feet). Even though best practice would be to move it, it works even if you’re a little closer or further away than that 4 feet. Quickly, altitude is one thing that matters a lot to me. I live in Denver, and I’ll play courses at an altitude from 5,000 to 9,000 feet. When I first opened the app, I was dismayed to see that altitude only went up to 3,000 feet. I e-mailed FlightScope support, trying to see if there was a fix in progress or a workaround. I sent that e-mail at about 9pm, and I had an answer at 1am. There is a workaround. You have to set the units to metric and then switch back to imperial to get above 3,000 feet. It worked just fine, and the adjustment is accurate. 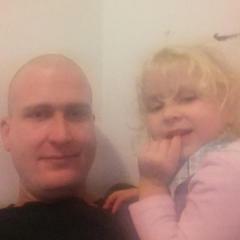 Support also said there is a fix in the works, so I’ll update this thread when that fix is complete. That said, kudos to FlightScope support here. I was worried this was going to be a strong negative, but it’s a strong positive. Yes, it’s a little annoying that I have to spend 5 seconds on this workaround every time I use the Mevo, but the response from support and the fact that I can adjust the altitude as I need to is a strong positive for me. I can get up to 10,000 feet in the altitude setting now, which I believe is enough for any golf course in the US. The app itself is fairly intuitive. There are two ways of recording data: data mode and video mode. Data mode is what you normally see from a launch monitoring, minus ball flight shown on a screen. Video mode records both the data and your swing. I strongly prefer data mode to the two. I’ve had a variety of problems with video mode, unfortunately. The biggest problem is that I’ve had issues with the Bluetooth connection in video mode. To get a good view of my swing, I’ve had to place my phone too far away from the Mevo to get a Bluetooth connection. This might be a quirk of too many electronic devices in the area or something, but it’s frustrating enough that I don’t use video mode. The other frustrating thing with video mode is that it uploads the video to the FlightScope server. I prefer to film my swing in slow-mo HD, which means it’s a pretty hefty file to upload to the server. That means waiting for that to finish until you can record your next shot. Fine if you’re somewhere with wifi. Not ideal if you’re out on a range with no wifi access. 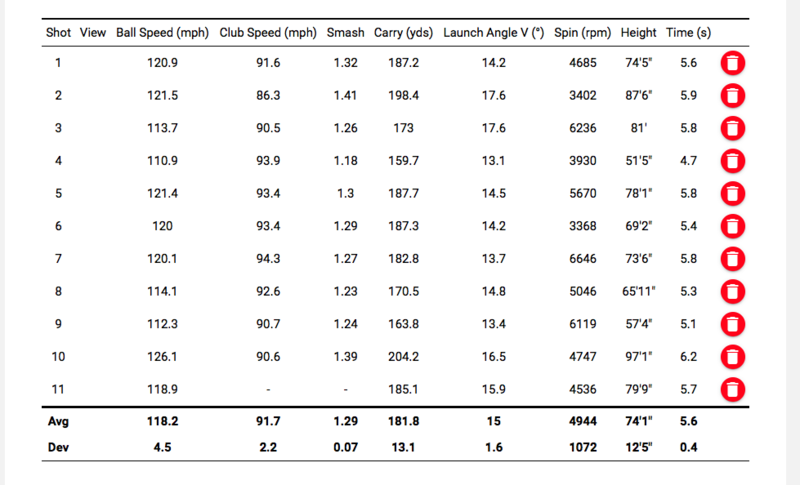 The Mevo records the following data: carry distance, clubhead speed, ball speed, smash factor, spin rate, launch angle, height, and time in the air. In data mode, there are 3 different ways to display the data: a custom set of data blocks that shows whatever data type you want (this is what I default to), a graph on top with all the data blocks, and a table that shows all the data from your session. Video mode offers all of the same data, but with video of your swing on top of that. It’s interesting to play around with, but like I said, it’s a bit of hassle to use. That’s why I have preferred to use data. It does not include spin axis data or other data to show where the ball is going horizontally. Depending on your point of view, this could be a problem. My view is that $500 does not yet buy you that data, which the market proves. I don’t think it should be a deal breaker for anyone seriously looking at this device. Unless you plan on only using this hitting into a net, you can get a feel for the horizontal flight of your ball by looking at it. One nice little bonus is that you can access all your data online. You create a FlightScope account and the app will automatically upload all of your data. Nice to be able to longingly stare at my numbers while at work, dreaming about getting out to the range to play with this tiny miracle again. Having sufficiently buried the lede, I can report that the Mevo is very accurate and a lot of fun to use! It is not 100% accurate. But, for the price, the Mevo’s accuracy is astounding. It’s not as accurate as a $10,000 launch monitor, but it’s close enough for almost any golfer. To try out its accuracy, I did three different tests. The first, and most obvious, was just comparing the distance the Mevo spit out to the landing distances of my balls at the range. The Mevo was consistently within a few yards on the distance. It was not off enough to bother me at all. Now, if you’re looking to work on your wedge distances to the yard like Dustin Johnson (did you hear he used Trackman to work on his wedges? ), it’s not precise enough for that. Let’s be honest, though, if you’re not precise enough for that either. But if you want to get your partial wedges distances down to within 5 yards, the Mevo will be perfect for that. I also tested this out on the course a couple of times: I would hit a shot with the Mevo recording the data. I would check the Mevo’s distance against my GPS unit’s distance. I got similar results to my range work. For example, on one 9 iron shot, the Mevo spat out 142 yards, and my GPS unit measured it 140 yards. Pretty good. I also think that 2 yard difference might be partially explained by my GPS unit not necessarily being accurate to the yard and the fact that was cold out – high 30s. By the way, for the pace of play worriers, I did my testing on an empty course and didn’t slow anybody but myself down. The final test was against Trackman. This was done indoors, and I think that had an effect on the results. The Mevo was not super accurate in this test. It was close, though. The carry distances were about 5 yards more on the Mevo, and some of the other numbers were off. However, I think there was both interference from the Trackman, and I didn’t position the metallic dots correctly all the time (more on this below). But it was still pretty solid, and knowing that the Mevo was better outside made me not worried about the performance indoors against the Trackman. There are some shots that the Mevo will not measure well. Low shots are tough for the Mevo to pick up, and they are also inaccurate when the Mevo does pick it up. By low shots, I don’t mean a punch shot, I mean a low screamer when you really thin the ball. But, uh, I don’t really want to know the distance when I hit that shot. If you hit a really bad duck or snap hook, the Mevo sometimes won’t pick up the ball, either. Because it’s behind you when you’re swinging, if the ball passes in front of you, it won’t pick it up on. Not that you need to know your distances on the duck hooks. There were also some times where I hit a low pull (I have all the bad shots in my bag!) and the Mevo would register a much longer carry distance than it actually had. Again, though, if you’re getting the ball in the air and down the range decently, you’re going to be very close with the Mevo. You do not need to use the metallic dots outside to pick up spin numbers. The Mevo is good at picking up the spin numbers on almost every ball. It’s not perfect, but it’s a perfectly acceptable miss rate. I think the miss rate is no different than other launch monitors, even the more expensive ones. I imagine the dots would help the spin rate be a bit more accurate, but I have not tested that. Nor do I want to use up a bunch of metallic dots on a one-time use. By the way, I never had issues with my driver data being off like other have had. I used my driver with the Mevo at 4 feet, and the numbers were not obviously off. 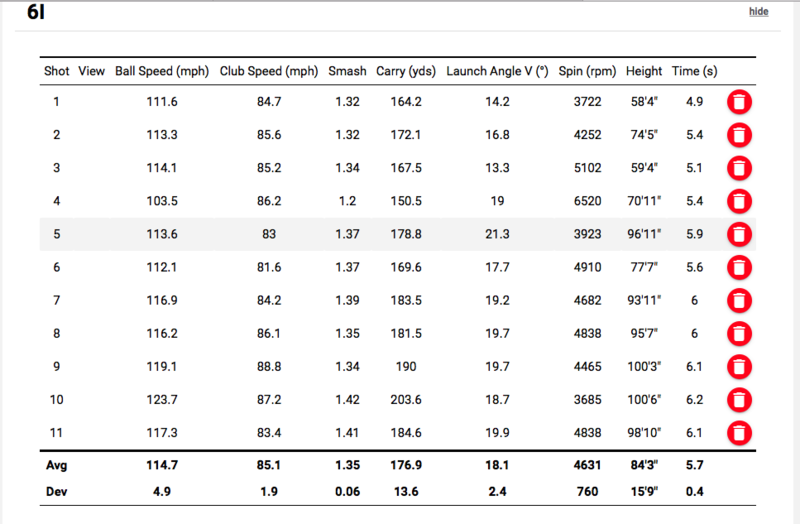 I did a fitting for a driver shortly after getting the Mevo, again using Trackman for that fitting, and the Trackman numbers were virtually identical to the Mevo numbers. I was actually surprised when I read that others had issues with driver data, because I have not had those issues. Now, after reading all this, what benefit does the Mevo have for your golf game? After playing around with this for over a month now, I can already tell it’s going to help me significantly. The biggest thing is that I found out is that my driver launches too low. Even with an 11 degree driver, I was only getting a launch angle of 12 degrees. This is something I will be working on in the offseason, and something that will save me strokes on the course. Like I hinted at before, it will also be useful for getting down partial wedge distances. Getting partial wedge distances can be a bit of a pain, requiring an empty course to hit a lot of balls on or a range with a lot of yardage markers. Your excuse for not having these distances is now gone. Another great thing about this unit is that it will actually tell you your real carry distances for a change. I’ve found that I was consistently about 5 yards off in my carry distances. That’s because, like every other golfer out there, I remember my best shots for carry distances and not my average ones. I will come up short less now because of the Mevo. This might not be true for everyone, but I play in a lot of different conditions. Travelling from Denver, altitude 5,280 feet, to anywhere else requires an adjustment for me. The Mevo will make that adjustment non-existent from now on. I can even prepare for the new altitude in Denver with the altitude setting. It would have been nice to have before the Newport Cup, where I dumped a decent amount of approach shots short of the green and into some nasty bunkers (sorry about those in alternate shot, @Kyle). If I go to a course in the mountains in Colorado, I can do the same thing. This is great for a golfer at altitude, or a golfer going to altitude. My wife wouldn’t let me a take a picture of the set up in the garage unless I cleaned the garage. Obviously, I took the easier route of not cleaning the garage. Now, a lot of the time, I don’t really want or need the Mevo data when I’m hitting into the net. 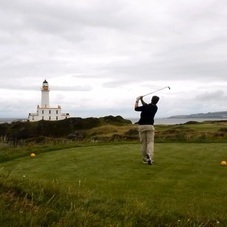 I try my best to just focus on my swing and changing the picture as opposed to a result. But it’s pretty cool to have the ability to see my numbers while hitting into the net. To test the Mevo with a net, I did two things. The first I already mentioned. I was at an indoor hitting bay with a Trackman and tested the Mevo a bit while I hit. Like I said above, the Mevo’s numbers were pretty good, although not as accurate as I had seen outside. But the Mevo didn’t have any trouble picking up the ball. I was pretty pumped to take the Mevo to my janky net set up pictured above and use it. Unfortunately, the Mevo was a pretty big flop with my net. It wasn’t great at even picking up the ball. Probably a quarter of my shots didn’t register at all. It also spat out some incredibly erroneous numbers. Although it picked up the club head speed just fine, and the spin rate seemed normal, which is odd, every other number was wrong. It varied from just wrong to very wrong. I had some 8 iron shots that carried under 40 yards. Launch angles were wildly different from what I had with outdoor shots. Height ranged from what I expected (between 90 and 105 feet) to 20 feet. Not great. I was actually pretty surprised by this. After the hitting bay, I figured my home practice net would work just fine. For reference, the ball flew for between 9 and 11 feet with the net, which is about as much distance as I’m comfortable with before I worry about missing the net completely. I didn’t think to measure the hitting bay at the time, but I would guess it had 20-25 feet of ball flight. I played around with moving the Mevo around, ensuring it was on the same level as my hitting mat, trying a different mode, and nothing made much of a difference. Honestly, after being so impressed with using it outdoors, this was a bummer for me. I don’t practice a ton with my net because I prefer to go to the range if at all possible (and yes, ranges are open almost year-round in Denver). But it would be really nice to be able to use this with my net. With all that said, considering it worked in the hitting bay, I bet I could finagle a way to get it to work with my net. I do have some guesses that could help it work: (1) obviously, find a way to have the ball flying longer, and (2) remove other objects from in front of the Mevo, which could be interfering with it. I plan to play around it with this winter a bit more, and I will update the thread with any new findings I get from that. If you are looking for something to help you with your practice at a range or a more extensive hitting bay, I highly recommend the Mevo. For the price of that new driver you talk yourself into every year, you great very accurate data that will help you improve your game. The price, compared to any other product, is impossible to beat given the data it gives you. If you are looking for a device to spit out accurate data with a cheap practice net without much ball flight, this is sadly not it. For me, the Mevo is my new favorite golf toy, and I’m really excited to have a full offseason to practice with it and fine tune various aspects of my game. While I needed to mention the issues I had with the net in the review, I don’t personally consider them a deal breaker. It just means when I use the net, I need to focus on changing the picture instead of crushing the ball for the benefit of my Mevo data. Indoors, it could actually be the Trackman that was giving the poorer yardages, especially if the height (elevation) was off. Just saying… let's not assume the Trackman is absolutely right, always. Positioning the Mevo only 4' behind works, but I've had better results at 6 or 7 feet. Particularly with longer clubs. That's still really close, though! Perhaps some software/firmware updates helped with that. I put the metal dot on the top, so then you're hitting it all around the equator. If you put it in the front, you hit the same place on the ball all the time. The point is to get the dot so it spins around the back side of the ball, so anywhere on that "longitude" will work. I've hit into a short net with really good results. I'm curious what the FlightScope support people will say. Send them a picture of your setup from above. Interesting. I followed the instruction manual on where I put the dot, but I will definitely try putting it on top next time. I will shoot support an e-mail and see what they say. I want to get this to work with my net. Like I said in my review, I'm going to keep playing around with it and my net. I will update the thread as I continue to mess around with it. Right, they say front, but the point is just to orient it so that the "backspin" exposes the dot to the Mevo. So we've always used the top, because that means impact will be anywhere around the equator (technically below the equator, but you get the picture). I want to say thank you for such an in-depth review. I haven't read it yet admittedly. I need to purchase and then set up a swingbox, but a tracker like this is the next goodie for that room after having something to hit into, and I really appreciate having such a writeup from someone I trust. 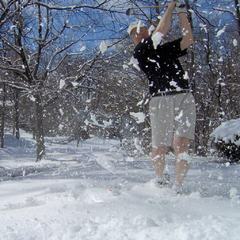 FYI - I heard back from FlightScope this morning. They have some suggestions with tweaking the setup and trying things within the app (mostly moving the distances). I should be able to try out their suggestions this weekend, and I will report back. Great review and it's good to see such positive and in-depth feedback. Hope you find a workaround to the net issue! Data seems to be about right. I do think I'm swing slower into a net than outside, which is probably the biggest difference in the data. The only negative is that it was still missing some shots, although it got better as I used it more with the net (also after I raised the Mevo to higher than the mat). It probably missed 4 of my first 10 shots, but then I think it only missed 1 or 2 after that. Dot on top is the way I go. You posted this 2 weeks ago and I read right over it. Dot on the top next time it is. Wanted to post a little update to my review. FlightScope has updated the app and the firmware for the Mevo a couple of times since I posted my review, which has been a great thing. The app is a lot more stable now - I didn't ever have a huge problem with it, but I know some other reported it. I did, from time to time, have some issues with the bluetooth connection, but that's also vastly improved now. The firmware updates have also made it so the Mevo misses a lot fewer shots than it used it. It was never a big problem for me, again, but it missed maybe 1 of every 20 shots or so. I don't think it's missed a shot when I've been using it recently. There a couple of other nice things in the app update they did. It's easier to tell when the Mevo is ready to record data from further away now because there's an icon that changes to green when it's ready (it used to just stay blue the entire time). They also made it so I don't have to switch to metric and back on the altitude setting. So, kudos to FlightScope for doing all this. They're constantly making this already impressive product better!